"Will you start the fans please!" Any 90's TV fan will remember Richard O'Brien's famous catchphrase from one of the decade's most popular shows - The Crystal Maze. Now, 25 years after it first aired on Channel 4, plans are under way to bring the show back as a live immersive theatrical experience. It means fans of the show may finally get the chance to take part in a fully-realised replica set in London. If you're over the age of 30 and you never saw it (and quite frankly... where were you?) the scale of The Crystal Maze was epic. Filmed at a huge air hangar in Essex, teams of six would complete a series of mental and physical challenges in different themed zones (Aztec, Industrial, Medieval, Futuristic and, later, Ocean). 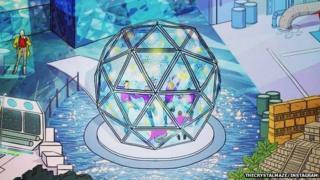 The aim was to collect crystals in order to determine how long they would spend within a crystal dome - inside which they would try and grab golden tickets - in the show's finale. It first aired in February 1990 and regularly attracted five to six million viewers per episode, running for six series. I was one of the lucky few to actually be a contestant on the show, appearing on a children's special in 1992. It was just as much fun as you'd expect. So, at a studio in east London, I meet the three producers hoping to make the new Crystal Maze a reality. Image caption My 10-year-old self as a contestant on the Crystal Maze in 1992. To realise the dream of bringing back The Crystal Maze, they're turning to the public for help, via a crowdfunding project. There may be a long way to go, but they are boosted by the fact that ... yes... original host Richard O'Brien is involved. "He (Richard) took a bit of tracking down as he now lives in New Zealand," says Ben Hodges. "He took a bit of persuading. We had to pitch the idea and he had very high standards but eventually he came on board." Hodges, along with co-producers Tom Lionetti-Maguire and Dean Rodgers, make up Little Lion Entertainment - the team behind the project. O'Brien's exact role is being kept secret though it's unlikely he'll be taking recruits around any newly constructed maze, playing his harmonica or introducing contestants to his 'Mumsie'. He does, however, appear in the video to launch the project. Image caption Richard O'Brien in one of the test game rooms for the new immersive event. "We've calculated we need a minimum of £500,000 to make something we're happy with," says Hodges. "The appetite to take part would be great." Wearing customised Crystal Maze bomber jackets, it's clear the Little Lion team are all massive fans of the show. "My biggest memory was just how incredibly extravagant it was. It was crazy, it was over the top," says Lionetti-Maguire. "The idea is simple. We're keeping the show as it was but opening it up to everyone to go and experience," says Hodges. "It's such a great show so there's no real need to change it." The producers point to the recent successes of Puzzle Rooms, where people pay to spend 60 minutes in a locked room attempting to find enough clues to escape, as proof audiences are hungry for the kind of immersive experience the Crystal Maze show will offer. "It taps into the right level of trend surrounding the puzzle room experiences currently out there," says Dean. "The people who watched The Crystal Maze when they were kids are the ones going to these puzzle rooms. "It's the best marrying of ideas and is about capturing the zeitgeist." Image caption A mock-up of a game from Aztec zone which may feature in the immersive Crystal Maze. The plan is to allow teams of six to take part in a series of games and finish inside a replica crystal dome, complete with working fans which are used to toughen the challenge of grabbing as many golden leaflets as possible. The producers say they've got a "bible of games" from the show's original creator Malcolm Hayworth, who is also on board. As well as raising the capital, they still have to find an exact location in London that's large enough to build the set - originally the size of two football pitches. A couple of sites are being earmarked, is all the producers will say. Fans can now register their interest to take part in the experience and, if everything goes to plan, the immersive Crystal Maze will launch in late 2015.